come get your copy to sign from GRID! by Neele Hülcker, Stella Veloce, Maya Shenfeld, Madeleine Johnson Gille and Lucie Vitkova. In the process of writing this statement one point became very important to us. Talking about diversity and inequality of representation, in 2016, requires that transgender and intersex identities would be included as a part of our group as composers, musicians, thinkers and artists. Speaking only of men and women automatically excludes so many conceptions of gender. Cis-gender refers to individuals that identify with the gender they were assigned at birth. Trans-gender is an umbrella term for individuals who do not identify with the gender they were assigned at birth. Intersex refers to people whose bodies, reproductive systems, chromosomes and/or hormones are not easily characterized as male or female. It is important to us that these identities are represented in our reflection. 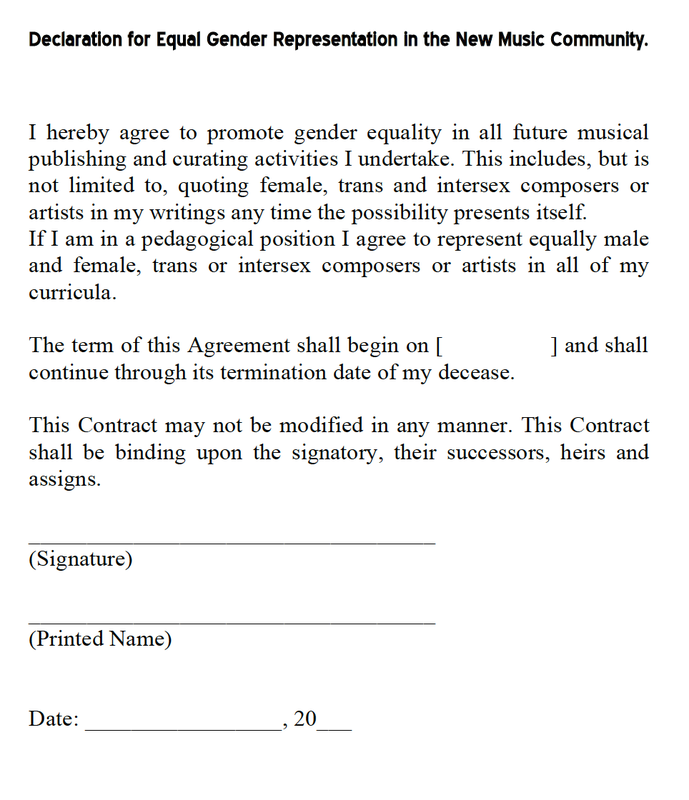 Recently there have been some attempts in the media to bring up the topic of gender imbalance in contemporary music composition. We agreed with her and would like to base our statement on the question how this exclusion works. Composers have to speak their mind out loud, with no hint of doubt. This is exaclty what very often a young boy is expected to do and a young girl is told not to do. Of course this is a big obstacle for young women, trans and intersex people to be taken seriously, also by themselves. Many highly talented girls grow up full of self doubts without the confidence to show their work to other people. Growing up in the 90’s superwomen did not exist yet, we had spiderman, superman and batman. These are just a few of the first things we learn through puberty. Being confronted with societies clichees about gender. But we didn’t learn about confident female, trans or intersex composers and conductors to inspire us to study composition and become a fulltime professional composer. All these examples, still don’t explain the enormous gender inequality that we find in the contemporary music scene. We think there are two basic problems that lead to the unacceptable situation of gender inequality within contemporary music. The first one has to do with confidence and the lack of role models -especially in universities- and gender expectations in general. The other is connected to how the contemporary music scene works as a market. Specifically, how curators make their programs. „A couple of my FB friends have put out calls recently for female composers. That’s great. Take a moment to reflect on the music organisations, ensembles and institutions surrounding us: The networking structures of those operate in repetitive and clear patterns. But why not step off the ways and try something different? Again: Why is the new music scene a basically white cis male club? Can you believe that in the history of the Darmstädter Ferienkurse there were 14 years in which not a single woman, trans or intersex composer was programmed? And 12 years in which just one woman was programmed? Why did everyone accept that? And by „we“ I mean all of us, no matter what gender you identify with. There are increasingly more feminist networks like Konstmusiksystrar, Her noise, female pressure, waking the feminists and others who are supporting women and trans composers, sound artists, DJanes and others. These kinds of network-work, empowerment and visibilty as well as hearability is definitely needed to unite the voices that go unheard. The composer Hampus Noren was invited in 2014 to the festival sonic in Kopenhagen, after realizing that Sonic was yet another heavily male dominated festival he chose not to play his own work but instead he gave up his seat for a female composer. He chose to present a piece by composer Marta Forsberg followed by a presentation on statistics on performances of music by female composers in swedish music institutions. A great initiative comes from the fantastic feminist composer collective Konstmusiksystrar from Sweden. They recently did a 2-day workshop course in experimental electronic music and contemporary art music for girl- and trans* participants between the ages 13-19. The participants made graphic scores, listened and analyzed sound, recorded sounds and worked with these digitally. At the end they performed for each other. Konstmusiksystrar also recently organised an international female and trans separatistic conference on new music and sound art in Berlin. This sort of activity is a very good example for what we all need right now: building networks in order to organise our work and activism, empowering our own, and the next generation of female, trans and inter composers, and becoming a bigger community that can not be ignored.